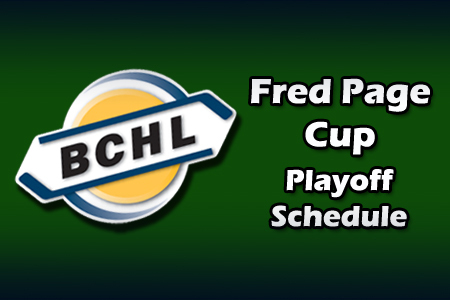 The BCHL has released its schedule for the 2013 Fred Page Cup Playoffs which will begin on March 15th. The British Columbia Hockey League has sent out the dates for the 2013 Fred Page Cup playoffs. In the Interior Division, best-of-seven rounds will be played in the semifinals and finals to determine the winner of the Ryan Hatfield Trophy. In the Mainland and Island Divisions (Coastal), best-of-five rounds will be played in the quarter-finals and semis followed by a best-of-seven to determine the winner of the Cliff McNabb Trophy. To be completed between Friday, March 29 and Sunday, April 7. Teams will arrange travel dates once the match-up is determined. To be completed between Friday, April 12 and Sunday, April 21. Teams will arrange travel dates once the match-up is determined. The Coastal champion has home-ice advantage this year.